I purchased one of the first Yoga 2 Pro systems and seem to be having problems with my wifi connection. If the wifi signal is at all weak, it just seems to drop out. Is there a fix or update I need to apply? A new wireless (wifi) driver designed to increase wireless performance and stability was provided by Intel and included in the preload on all systems built October 5, 2013 and later. Units built prior to this date have an older driver that should be updated. This addressed some of the early concerns, but additional updates have been made available on the Lenovo support site. Please check your current installed driver version against the latest available on the support site. Update - Intel has continued to release updated versions of drivers for the 7260 family of Wireless cards, and Lenovo has tested and released signed versions via the Lenovo support site at intervals. Please visit the Lenovo support site and install the latest version of drive for your system. Current version as of today is 17.0.3.3 Please use this or later driver from Lenovo's Support site. Modify abiltiy of Windows to limit power to with wifi card to save battery life - this can lead to reduced range and disconnects, especially while running on battery. Here is how to affect this setting. This is a common wifi troubleshooting suggestion in Windows going back to XP - it can be found in multiple discussions in this forum and is not specific to Yoga 2 Pro systems. Some customers have suggested that some intel software in the preload might be causing a conflict in some cases. Reboot to ensure updated driver and settings date effect. Be sure to check wifi driver version in device manager to confirm it is the latest version you just downloaded. Thank you, I didn't see an update for the Intel Wireless driver -- I think I did that previously based on your advice to someone else. I believe the situation has gotten better. Thanks for the help. I continue to experience dropped connections even after updating the drivers. This occurs three to four times in an hour. I already updated the whole system, I've got the new driver from intel and the problem still persists. Is there a new fix for this problem? It seems that there hardly will be a software-solution for a hardware-problem. Lenovo should change this wireless-modul but it's completly unacceptable that they present fixes a an placebo to calm there customers. Having the exact same problem with 5 new Lenovo Yoga's running Windows 8.1. All the drivers and patches applied to it not only has WiFi connection problems, but it takes down WiFi networks in general. Work and home the disruption to the networks is horrible. We have to leave the machines off. We tried going back to the factory OEM install, and the same problem occurs. No other software installed other than the Lenovo and Windows patches. The only thing that has worked is to install our own copy of Windows 8.1 on the machine. Then the WiFi seems perfect. So the lesson at the moment is the OEM install of Win8.1 from Lenovo is broken in a serious way that you can't even use the device on the WiFi. That's a great observation that might help Lenovo to fix the problem. Meanwhile I purchased Intel's Wirless AC 7260 card from Amazon. It fixed the problem also. But it's a pity that Lenovo doesn't recongnize the problem. They simply do nothing. 5. Finally uninstall “Intel(R) Smart Connect Technology” via the Control Panel...(mine was version 4.2.40.2418, 30.3MB). I asked why remove this and was told there is a conflict between this driver and the other one. I've got a Lenovo Yoga 2 Pro 13 inch, bought in the US in April. It has been back to Lenovo already because it wouldn't connect to the internet and Windows said it couldn't locate any networking hardware. It worked for two weeks but now it is saying its got limited connectivity and cannot connect (although four other devices manage to connect OK). It's not fit for purpose! I followed the instructions to no avail and also followed those suggested by Rob D above- still having about 4 drops a hour. Very annoying - please provide a fix Lenovo! Is there a manufacture date after which this crap doesn't happen anymore? Wi-fi is probably THE most important part of a laptop these day and how a manufacturer does not get this right is a mystery to me. Stunning. Especially for a machine that, in other ways, is as nice as the Y2P and people are paying over a grand for. I just bought the Lenovo Yoga 2 from Best Buy this afternoon. Now I come on here (on my Dell desk top) and read this about having trouble hooking to the internet. This is the only reason I bougyht a lap top. So I could hook up to the internet while I am away from home. I don't want to jump through hoops to make it work. Will they take it back at Best Buy? It isn't opened yet. Recently installed the 7260AC card in my Yoga 2 Pro. Works great @ 2.4GHz. That means ~50MB/s download. Switching to 5 GHz yields slightly higher (maybe 55MB/s)....for a little while, then the connection drops and resets. Again and again and again. Why? Compared to another Dell laptop (Intel Centrino Advanced-N 6205) in the same house, at the same physical location, gets steady 50MB/s at 2.4GHz and 95-100MB/s @ 5GHz. I have installed the 17.0.5.8 driver and am frustrated. What am I doing wrong? Should I consider a different card? It is September 2014 and my brand-new Yoga 2 Pro can't connect in parts of my house that every other Wi-Fi device, including a five-year-old, $275 Acer laptop, can connect. I need a fix. My WiFi speeds on my Yoga 2 Pro have been abysmal over the past week or so. Other devices in my household will average 22-32Mbps download speeds. The Yoga 2 Pro only ever got 7-8Mbps on its good days, but in the past week or so it averages 0.5-1.5Mbps, which is completely unnacceptable. I assume it has something to do with the official driver distributed by Lenovo not gelling well with the new Windows 8.1 update. It's mind boggling to me how subpar Lenovo Support is. What a waste of $1300. I anticipate further updates to this driver. Testing on some of the ThinkPads like the X240 may run a bit ahead in terms of driver versions. It uses the same card, so you may check the version available there. Today that is 17.0.5 which should be later than the Yoga 2 driver. I have the X240 drivers with a customer on twitter today with reported good results. Lastly, you may want to check windows settings and disallow Windows from managing power to the wifi card as Rob suggests above. Windows can cut power to the card which can cause drops. The drivers alone may not solve drops. I agree with the stated importance of stable performance on wifi. i am considering in getting a y2p.are new models still experincing these issues? Would it help if i connect an external ac adapter. My recently shipped Y2P, according to device manager has Version 17.0.3.3 dated 5/26/2014. 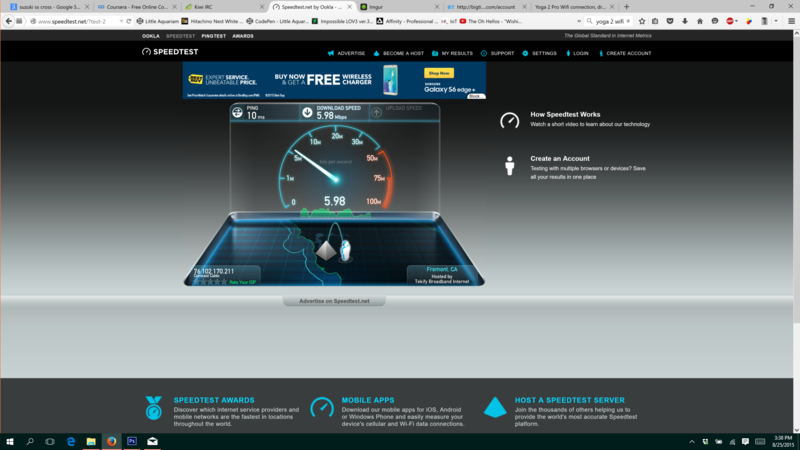 I have been running 17.1.0.19 for a couple of weeks now and my disconnection issues - both wifi and BT mouse - have disappeared. In the mean-time, i had ordered an dual band AC 7260 replacement card. I went ahead and installed it today and it seems like a different machine - sooo much faster. Definitely worth the $30 upgrade cost. Problems behind me, I love this Yoga. I just purchased 2 Yoga 2 Pro, all seems perfect but the wifi, which - I don't have to tell you - is slow to non-existent. The driver version on both is 17.0.3.3. My router is new and I have a much older HP which connects easily. I installed the 19-Sep-2014 dated v17.12.0 wifi driver for a Y2P manufactured about 11months ago. However the wifi drop-outs still occur. The wifi driver crashes and the pc loses internet connection. I have to run the Windows "Identify and repair network problems" utility from control panel to reconnect, else it needs a restart....! Can LENOVO please advise why after numerous driver updates we still face issues? Will Lenovo be providing a replacement wifi card? My 2 week old Y2P is having the same wifi issues - Over to you Lenovo! Btw, I noticed my new Y2P has intel PROSet/wireless software version 17.0.3 (Dated 30 AUG 2014) so I tried downloading the 19 SEP 2014 version quoted in hi0parag's post (which I'm presuming is an even later update?) but for some reason I'm getting the below message suggesting the 30 AUG version I already have installed is later than the 19 SEP one I was trying to install???.... Very confusing and frustrating.. Anyway, either way, I think its back to the drawing board for Lenovo.. I have the same problem: "A newer product version is already installed"
Have you found a solution? I spent days looking for solution, tried everything, updating drivers, rolling them back etc. Went through all the 144 pages of this discussion. Tried solution which jgunderson posted here http://forums.lenovo.com/t5/Idea-Windows-based-Tablets-and/Re-Yoga-2-Pro-Wifi-Problems/td-p/1452437/highlight/true/page/6 to turn off the Bluetooth AMP. Did not work. Then, I went into SERVICES, there are 3 Bluetooth services there: Device Monitor, OBEX service and Support Monitor. If you double click, it will open properties and under Startup type switch to Manual. That did the trick for me, for now. It seems that the wi-fi works fine now. Will return in couple of days here to confirm. VladVonHistria - did your solution above work? I'm been on with Lenovo support twice this week. Basically they've just rolled back my drive and adjusted the power management settings as referred to in this strain. But its still dropping wifi and now they want me to send my computer in to their repair setting so I will be down for about two weeks. But maybe they will replace the wifi card? I wanted to try your solution first, if it works. Where is the SERVICES? I couldn't find it on the Adapter properties, but I did find the Bluetooth AMP. I have tried all the above solutions without any success. Still dropping off and some cases not able to connect to a wlan. Not willing to send my laptop from Finland to Germany for repair to 3 weeks without any guarantee of success. Decided to replace 7260 with its 7260AC version. This seems to be hard to find in Europe, why I'm asking if Intel-7265 could be used as well? I just added in the a new wireless ac card myself and everything now works perfectly. This is also an option. You can also add in the new wireless ac card yourself if you want This is what is probably in the yoga 3 pro. Here was a great how to and it all worked perfectly for me. You can also have a tech and your local computer store do it I'm sure.. Not sure if it would void your warrenty. I don't think so. Install new wifi walk thru from Epic Reviews tech. I have a weird problem - download speed from dropbox.com is always very slow on my Yoga 2 Pro, about 100 KB/sec. When I am downloading the same files on the same wifi network on another laptop, I get 10x times faster speeds. This only happens with dropbox, other websites work fine. I tried disabling firewall, antivirus, tried 3 different browsers. Even tried disabling the internal wireless and connected an external USB wifi adaptor - no difference. i am so frustrated. i have yoga 2 13" and most of the time it sits and collects dust.... an expensive $950 coaster on my table. it will not find existing internet connections and at home it drops the connection every few minutes.it is so slow to open files that my 8 year old laptop is quicker. more often than not the touch pad and cursor dont work. I am in tears. I have gotten no satisfaction with Lenovo or Best Buy. been trying for months. I just want a new laptop that works. i thought i was buying the best. I am not a computer tech....some of these fixes seem difficult. Is it wrong to expect a name brand expensive laptop to work properly? I finally gave up and called Lenovo Tech Support and they resolved the issue. In addition to the power settings changes they deleted 2 pieces of pre-installed software. One was some sort of Intel Wireless management and the other was a Lenovo package. Sorry I don't recall the names as the tech was working quick and I wasn't writing down the items. But since the call I've been working perfectly. The tech said there were known problems with the two program that would cause the WiFi to connect and drop. Give them a call at 1-877-453-6686. Be patient while you wait for someone to talk to and while they follow their script. Eventually they will get to the issue. Thanks for the feedback - the intel software uninstall was previously mentioned and I've updated the article to reflect that and the driver setting change to prevent reduction in power to the card. The 7260AC card will work but you need the Lenovo version of it as it is SAR compliant. Also of note, the strongest wifi performance should be with the system in normal laptop mode vs tablet. When you fold it into tablet mode, wifi power is reduced by design. If you find other setting changes / software version combinations that either caused a problem with wifi or improved it, please share. We can continue to update the article to reflect the most common solutions. > I have the same problem: "A newer product version is already installed"
> Have you found a solution? you can do the same uninstall for " Intel Smart Connect (ISCT) "
Tried everything on the article. Don't make it hard, Put a fix out there. It's simple, Wifi don't turn off after restart. There now Go do it! After so much time wasted on this wifi problem I've fixed it, USB tethering your mobile phone works every time!!! Thanks Lenovo for selling such a substandard wifi laptop on a high spec machine and for the days of my life I'll never recover trying get online, reseting connection, rebooting, upgrading the card, applying so called fixes and trying to do the most basic function we all use a laptop for... I'll be sure to pass my honest experience on to people I meet about Lenovo. 3. Uninstall this driver, also tick the remove software in the tick box. 4. Afterwards it will not be listed in the Network adapters until you right click and scan for hardware changes, do this. Now it will appear and it has loaded a default diver that’s located somewhere in the computer despite you just uninstalling it, don’t worry about this as the next steps will sort it out. 6. In Device manager: time to update the driver, Network adapters -> Intel® Wireless-N7260 -> right click properties -> (TAB) Driver, and update the driver and do it manually. Select 'Browse my computer for the driver software' … Now point to the driver you've just loaded in C:\Drivers\Intel WLAN Driver\Win7Plus\Win64. BTW, now sure if this works with the dual band wifi card upgrade, I had upgraded it ages ago but put the old card back in as it was impossible to use still dropping the connection, bla, bla, bla, bla, bla… If this driver 17.0.3.3 works I might try changing it again. What a sack of **bleep** this purchase has been. Wifi is the most important part on a work laptop. Will NEVER buy Lenovo again. Thanks for the wifi related headaches I have to endure every day. Some of us can't afford to drop another 1k on a laptop, so I'm stuck with this monumental piece of garbage. Assholes. And here it is back to the state it's usually in. Same issues with Wifi, and additionally, now computer has become intolerably slow (I'm talking 5 minutes to just open a folder). Unfortunately I'm not sufficiently techy minded to understand all of what to do above. Have wasted over a couple of days trying to get internet conection, and am completely over it. This Lenovo Yoga 2 is the first Lenovo I've ever bought. Will certainly be the last. It will be placed in the bin just as soon as I get a replacement laptop. I don't need feedback thanks, just got on here to have a whinge about Lenovo equipment in the vain hope that a Lenovo consultant will see it, and something will be done to avoid this situation in the future. After reading the above comments, however, I won't be holding my breath. Good luck all....looks like you'll need it. I found a solution that works! Cannot connect to WiFi because "limited connection" and/or "No internet connection". If I run "Troubleshoot this problem" for the WiFi connection, it resolves the problem, but within 15 minutes it's disconnected and broken again! Cannot stay connected to the internet and/or WiFi network. Device Manager (you must be signed in as Administrator; or run "cmd" [As Administrator...] and type then hit enter: control hdwwiz.cpl). Right-click Intel(R) Dual Band Wireless-AC 7260 and select "Properties". When the window opens, select the Advanced tab. In the left options list, click/highlight "Preferred Band", and then in the right dropdown, choose "2. Prefer 2.4Ghz band". And the same process to select "Wireless Mode" and choose "4. 802.11b/g" from the dropdown. Now click "OK" at the bottom of the window, and give your computer time to reset the driver with these new settings. Disconnect, and then Connect to your WiFi connection. Should be good now! Yipee!! I After months of constant frustration trying to fix the issue with my computer dropping the wifi connection every 20 minutes, I have finally resolved the problem. Hopefully this fix will last. I had the same problem come up over a year ago, fixed it and then it started dropping the connection again this year. I tried every single fix that was posted in this forum, including uprading my wifi card to the newer, dual band wifi card, but all to no avail. What did it for me was purchasing a very simple $15.00 TP-LINK 300Mbps mini wireless N USB adaper at Fryes. I am connecting to the internet via this exteral wireless adapter, while keeping the interal wifi card enabled. This last part is very important because initally I disabled the internal wifi card. When the interal card was disabled, the USB wifi adapter started dropping the internet connection. But when when I went back into the device settings and enabled the internal card while still using the USB wireless adapter to connect to the internet, voila! No more dropped internet. I can't tell you how excited I was when I woke my computer up this morning and it it immediately was connected to the internet. For the past few months, I've had to restart my computer every 20-30 minutes to get it to connect again. I was so ready to just throw in the towel and spend another $1000+ on another computer and just call this one a total loss. Thanks Santa! This is an awesome New Years gift that I pray wll last. Hi everybody! I've decided to tell my solution to the problem. I bought Yoga 2 Pro and after few hours constant connection drops started. So I've tried all the methods above and nothing worked! I opened laptop (it's very easy to do with te right screwdriver) and took out wifi card (disconnect the battery first). Then I taped it around with electrical tape leaving connectors. To my surprise everything worked perfectly after and even much faster (the effect won't be straight away). Another thing I found out that WiFi due to its' drivers or design is conflicting with bluetooth devices. Some of them work n the same frequencies and wifi isn't switching to the different channel automatically. For example, my mouse with bluetooth dongle totally destroys wifi on the laptop (bought new bluetooth mouse without dongle). Don't know about native bluetooth 4.0, haven't tried it yet, but try to switch it off. Also look around in your room or net room for any working bluetooth device, like phones. Probably driver update helps, but I have the latest one. Another solution is buying dual-band wifi card and switching to 5GHz channel, but I haven't tried it yet. I hope it really helps somebody. This is an update to my post on 12-20-15. I am completely bummed to have to come back here and share that the external USB wifi adapter did not end up providing any kind of permanent solution. I am now right back to the dropped connections :-(. Boo! My WIFI works about 70% of nominal speed which is not good but...when I change into tablet mode the speed goes down dramatically. So slow that the Lenovo Solution Center does not even run. My download sppwd is only 10 mbps recently. I fixed it by upgading Intel wifi and bluteeth drives. Mu download speed is 50 mbps after the fix. 2. Manually remove Intel Driver Update Utility 2.6 if it's on your system before.